"Yesterday's Garbage: 1987-1992" is an exclusive 2015 Netlabel Day release featuring 10 boombox/4-track recordings from the early-to-mid years of The Martyrs. Recorded in the basement on cheap mics on cheap tapes. These songs, culled from the cassette archives, represent a small portion of The Martyrs Anthology, a project that may yet see the light of day. All songs written by The Martyrs. The Martyrs were formed in 1987 by four dumb kids from Long Island, NY. They recorded in the basement steadily until 1991, when college and a collective diaspora resulted in solo acts, duos and supergroups. They performed live twice (at a graduation party and a comically disastrous open mic night). Two albums in the late 90s were followed by a few singles in later years. They never broke up. 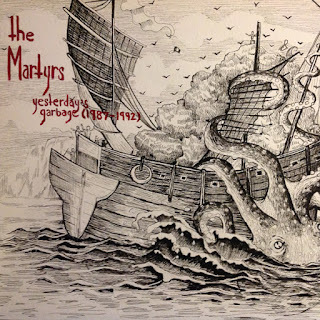 The Martyrs had no idea they could transmit their music out of the basement and thus never tried. They were a few years too soon for the 90s DIY scene, though I doubt that would have changed anything. Published under a Creative Commons License: CC BY-NC-SA 3.0 US (p) 2015 Sleeping Brothers Records.